What is Gingivitis and why is it important to understand when it comes to your health? Periodontal disease or gum disease is common in Australia and research released from the 2018 National Oral Health Report shows that about 20% of the population are suffering from it. The prevalence of gum disease in those over 65 years of age have rates closer to 50%. And the first step to periodontal disease is almost always gingivitis (inflammation of the gums). In this blog, you’ll learn about gum disease, its symptoms, and how to deal with it, and by the time you’re finished reading, you’ll know if or when you’re developing a gum problem that requires treatment. If you are aware of the signs and symptoms to look out for, you’ll also have an idea of how to prevent gingivitis or catch it early enough to reverse it with the help of Capstone Dental Seven Hills. To help you with this task, Dr Ken Chan and the team at Capstone Dental Seven Hills has put together this blog with a collection of information about gingivitis, its causes, signs and symptoms, and treatment options available. Gingivitis is made up of two words - “gingiva” which means gum/s and - “itis” which means inflammation. So gingivitis means gum inflammation -- an extremely common, early, and treatable form of periodontal disease. But if gingivitis is untreated, it can lead to a severe inflammation and infection of the gums, teeth, and small periodontal ligaments that link your teeth to the bone and the tooth socket. Eventually, if continued to be left untreated, it can lead to tooth loss, or worse. It is important to understand that Gingivitis is NOT gum disease. Gum disease is called Periodontitis. It is important to understand this distinction because Gingivitis won’t cause any permanent damage to the gums and bones that hold the teeth in the jaw but Gum Disease (Periodontitis) will cause permanent damage that can’t be reversed. And while Gingivitis won’t always lead to Gum Disease (Periodontitis), it is often what occurs before gum disease occurs inside the mouth. Plaque buildup is the culprit in gingivitis. Plaque is made from a mixture of your saliva and all the leftover food scraps inside of your mouth and it often gets caught along the gumline and in between your teeth. If plaque isn’t removed during brush and flossing, it slowly forms and calcifies into tartar (also known as calculus), a hard rocky cement version of plaque which gets stuck and trapped at the gumline of your teeth. This leads to bleeding, sensitive, infected, and inflamed gums. If this condition is left unaddressed, it can turn into periodontitis, causing receding gums, sensitive teeth, and in severe cases wobbly and loose teeth that fall out. If any of the factors mentioned below apply to you, please do pay extra attention to your teeth and gum line. Smoking/tobacco use is one of the most common risk factors associated with gum disease. It can also decrease the chances of successful treatment because it affects the blood circulation of the body. Smokers are 7 times more likely to have gum disease than non-smokers. Poor diet and nutrition makes it more difficult for the body to fight gum disease, and some vitamins are demonstrated to improve gum and bone health. Chronic diseases, such as diabetes, HIV, and cancer affect the body’s ability to fight gingivitis. Minimise your snacking habits especially after dinner and brushing your teeth. Chew on chewing gum, rinse with and drink water regularly, or brush after snacking. 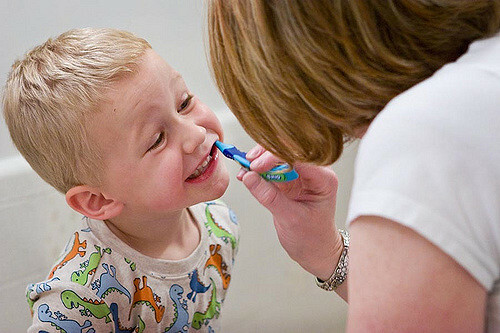 Visit Capstone Dental at least once every six months for a routine examination, scale and clean. Be aware of additional risk factors. Ageing, smoking, diet and genetics can increase the likelihood of gingivitis. If you have an increased risk factor, be sure to talk with Capstone Dental Seven Hills about it.